It's an interesting assumption of our age that all distractions were created equal and are equally meaningless. 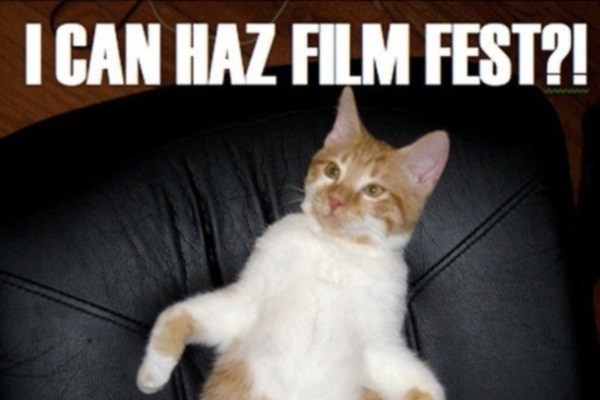 The Walker Art Center's "Internet Cat Video Festival" has brought into serious consideration the signal movie genre of the era. Compiled from online submissions, the ICVF invites viewers to "LOL in the presence of others as your favorite silly cat videos are projected larger-than-life one after the other." Composed of both famous, or relatively famous, and obscure, or really obscure, videos, the festival can be seen as both a bit desperately too hip and right on point. In contemporary net-slang, the term "cat videos" serves as a metonymy for the entire World Wide Web. If you said you spent the afternoon at work watching panda videos or bonobos videos, people would assume you'd developed a peculiar interest that day. If you said you were watching cat videos, people would more broadly assume you were simply doing not-productive things online. Vast stretches of the Internet seem like a discontinuous wasteland, so why have cat videos in particular become a symbol for the rest? And how have cats become perhaps the most pored over—and talked about—glyph in our visual culture? that, notwithstanding the extreme beauty of cats, their elegance of motion, the variety and intensity of their colour, they should be so little painted by considerable artists. Almost all the pictures of cats which I remember were done by inferior men, often by artists of a very low grade indeed. The reason for this is probably that although the cat is a refined and very voluptuous animal, it is so wanting in the nobler qualities as to fail in winning the serious sympathies of noble and generous-hearted men. Cats were strewn about medieval bestiaries, not always in uncomplimentary terms—the "enemy of mice" who can hunt at all hours because the "gleam in their eye" lights up the darkness—but they were mostly demonized in the era. Medieval leaders thought the beasts wicked, feminine, and sexual, and orchestrated public burnings, helping to tip populations of plague-spreading rats into catastrophic proportions. With their famously enterprising incompetence, serious men of the Middle Ages suspected cats might be spreading disease and tried to stem the plague by orchestrating even more feline shoahs. As the Enlightenment dawned, people took a more measured approach to cats, recognizing their utility and encouraging domestication. Cats began appearing in paintings and engravings of daily life. Often recessed in the background as realistic touches, they also sometimes retained associations with the illicit. In Israhel van Meckenem's "Visit to the Spinner," the cat in the foreground is meant to alert the viewer to the placement of the sword between the man's legs, the forward tilt of the woman's posture, and what this "visit" is really all about. Probably because cats were thought "refined" and "voluptuous" while lacking "the nobler qualities" and associated with the "low grade," the silky creatures became essential to the vernacular of modernity. A black cat was conspicuously placed on the bed of Manet's "Olympia" to bear witness to the dawn of Modernism, the aggressive obviousness of the pun mirroring the heroine's defiant stare. Claimed for the whoring rebels of Paris, the cat traveled into popular culture through Parisian poster art, most famously Théophile Steinlen's eventually canonized ad for Le Chat Noir. But no sooner was the cat nightclubbing through European capitals than it was saddled with clothing, and often an occupation. Along with the trousered dog, it became a staple of early-20th-century kitsch. The pet is either sterilized or sexually isolated, extremely limited in its exercise, deprived of almost all other animal contact, and fed with artificial foods. This is the material process which lies behind the truism that pets come to resemble their masters or mistresses. 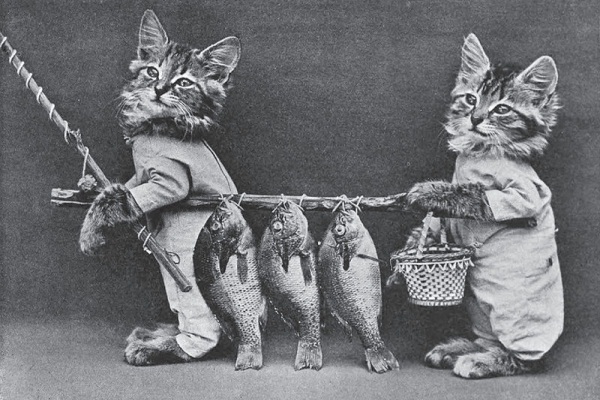 The most famous early-20th-century precursors to modern day lolcats can be found in the portraiture of Harry Whittier Frees, who, in a stroke of genius, opted for photography instead of photorealism, crystallizing the uncanny adorability we know from Internet cats. He often opted to caption his portraits with phrases supposedly spoken by the cats, and in fact imbued the cats with personality traits similar to what would be developed by the Internet hive-mind: his delicately dressed animals are the id of the middle classes, politely demanding all mod cons. The most interesting and disturbing painter of feline kitsch was Louis Wain. Wain began as a slightly eccentric commercial artist; as his battles with schizophrenia became more drastic, his paintings skewed to the absurd and, later, the psychedelic. His work, besides tracing the evolution of serious mental pathologies, highlights in an angular way something important: cats anthropomorphize bizarrely. What distinguishes modern kitsch representations of cats from previous modes is that here the cat is both lavished with detail and framed according to traditional rules for representing human subjects: even when not made to stand on its hind legs or put in a silly costume, the cat is placed near the center of the frame with its face as the focal point. The effect is often more than slightly unnerving. This is the treatment of cats that continued in what we now know as lolcats and cat videos. Cats first gained widespread attention on the Web through "Caturday," a weekend tradition on the imageboard 4chan of pairing pictures of cats with absurd texts. The invaluable website Know Your Meme notes that the tradition was in some form developed in earlier Internet communities, "carried over to 4chan from the cultures of previous PHP and vBulletin-based message boards such as General Mayhem." 4chan users began a Saturday ritual of posting pictures of cats, for no particular reason except that they could. This soon became known as "Caturday," with humorous phrases posted beside the so-called "LOLcats"—now the subject of LOLcat T-shirts, buttons and fridge magnets. 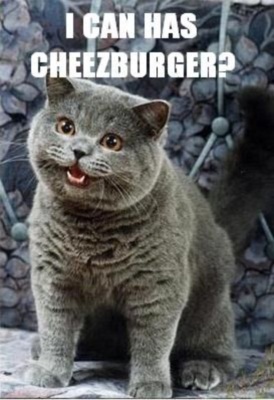 When a plump gray cat appeared with the caption "I can has cheezburger?" it caught the imagination of a man in Hawaii and became the subject of his blog, icanhascheezburger.com. The blog was eventually sold for about US$2m. The patois developed during Caturday synthesized multitudes of Internet slangs: verbs conjugated incorrectly, vowels omitted, malapropisms and letter substitutions whenever possible. The Internet was rampant with people deforming traditional English for various, mostly historically common reasons: to perform youth, evade authority, establish belonging, or fix an affect-deficit that results from speech-length communiqués rendered as text. Lolspeak, as it came to be known, collapsed all of these motivations together and began effectively erasing them, deforming language for the sheer thrill of it. In one of the Internet's vertiginous feedback loops, lolspeak itself began to be used casually on message boards, parody reinjected into the quotidian. n i walk in ur troofzorz. Most of the character names in The LOLCat Bible are based on famous images. Ceiling Cat predates the LCB, an embodiment of what many Internet users imagine God to actually be doing. While lolcats are supposedly disposable, many pairings are so apposite that they've had remarkable staying power: the innocent shame of I Made You a Cookie; the nerdy wonder of Let Me Show You My Pokemans; or the remarkable hair patterning of Kitler. "I Made You a Cookie... 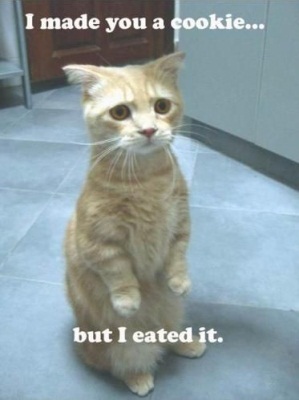 But I Eated It"
Some images of cats have stood a test of time without any text: the unintended mimic Willy Wonkat; the professorial Serious Cat; or the resourcefully outfitted Lime Cat. The advent of streaming video flooded the Internet with mobile kittehs, but cinema already had a long tradition of regarding the animals. Novelty short films like Thomas Edison's Two Cats in a Boxing Match or G.A. 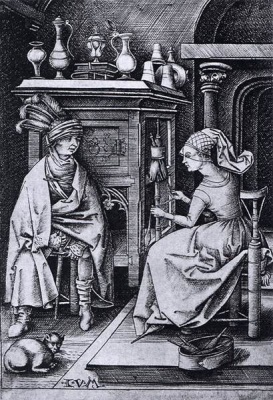 Smith's The Sick Kitten are illustrious early examples. The late Chris Marker had the most famous moving-image love affair with cats, as both image and metaphor. Marker spent his career obsessing over the way contemporary life seems to both intensify and liquidate our experience of time; in the political as well as in the personal, we are constantly made to feel as if we're moving toward a breaking point, which then is always perpetually collapsing. Cats seemed to embody this experience for him, somehow, perhaps in the way viewers are drawn toward and then down into images of them. Marker's 1990 Cat Listening to Music might, in the lazy obsessiveness of its form, be the prototype for today's cat videos. His iconic trickster pet Guillaume has been followed by, among others, the indomitable Maru; the uncanny Keyboard Cat; and the improbably limbed Mon chat se tient debout tout seul. Putting cat videos side by side reveals interesting connections: the unwitting verbal dexterity of both NONONONO Cat and Oh Long Johnson mirrors the disarming ingenuousness of Surprised Kitty and Lil Bub. The plethora of cats chasing laser pointers has something in common with the most famous Internet cat of recent years, Nyan Cat, which is really the face of a cat attached to a Pop Tart trailing a rainbow behind it through outer space. Set to an irritatingly catchy clip of Japanese pop ("nyanyanyanya") Nyan Cat became an instant viral sensation, garnering numerous spin-offs, including a Warholian 10-hour version. Suspended in space yet effortlessly carried forward, the fantasy embodied by Nyan Cat isn't new; we used to speak of "surfing the web." While cats have always been part of popular culture, the current intensity of focus is unprecedented. In the time of Harry Whittier Frees and Louis Wain, anthropomorphized cats were certainly not any more popular than anthropomorphized dogs. That cats have eclipsed dogs in visual culture might be because dogs, for whatever reason, seem to adopt natural-seeming human body language in a way that cats do not. Projection onto K-9s tends to be seamless. Cats, however, never seem quite totally present. Much of it is in the eyes: forcefully impassive orbs gently cradled in fur. Cats don't seem to pay attention through volition but to become absorbed in things, and to just as easily become distracted again. They flit from fascination to fascination without ever investing in any one object. And look at them all dressed up, awkward-looking, pretending to be real people when everyone can see they're lost in imaginary somethings behind their own blank gaze. In other words, when we look at cats, we see us in the age of personal computers. Watching cat videos has become a symbol for wasting time because when we think of ourselves wasting time now, we think of ourselves becoming obsessed with representations of ourselves becoming obsessed with the Internet, on the Internet. The meme known as "Catception"—the name derived from Christopher Nolan's pretentious 2010 film Inception—is perhaps the most brilliant of all Internet memes. The final element in every work of Catception is you; you are the cat who completes the circle of cats; you are always needed to fill the final void in the paradise of endless solipsistic recursion.